President Obama has decided to take corporate cash to fund his second inauguration, backing down on a 2009 stand. 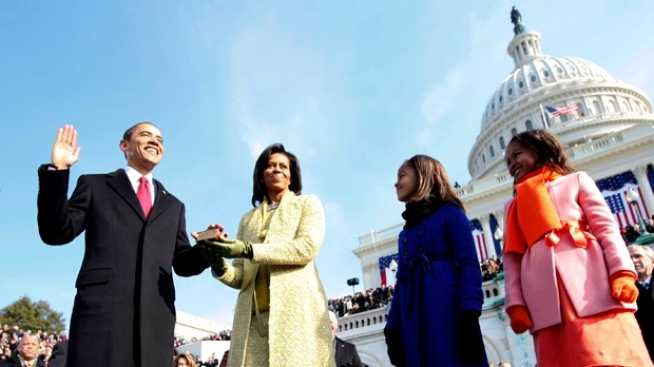 Barack Obama, with his wife Michelle Obama at his side, is sworn in as the 44th president of the United States by Chief Justice of the United States John G. Roberts Jr.
As he prepared to take office four years ago, Barack Obama refused to take donations from corporations to underwrite his inauguration festivities, a move that transition officials said proved his "commitment to change business as usual in Washington." That stand has since crumbled. Fresh off a billion-dollar re-election effort, President Obama has decided to tap corporations for help footing the bill for the parade, parties and other festivities surrounding his second inauguration on Jan. 21. Obama also lifted his 2009 cap on individual contributions, meaning that anyone can now give as much as they like. Obama's inaugural committee says the president changed his mind because he wants to avoid having to hit up supporters who, during an economic downturn, dug deep to help fund the most expensive campaign in history. But good-government advocates say the retreat is dangerous because it risks, at best, the appearance of corporations attempting to curry favor with the White House. "Companies make this investment because they hope to get something out of it," said Robert Weissman, president of Public Citizen, a Washington watchdog group. The inauguration fundraising covers the bill for all events outside of the U.S. Capitol grounds, along with all security costs, which are paid by taxpayers. It is possible that corporations help fund inaugurations for the good it might do. But most political spending is to obtain "preferred access and a sympathetic ear when they have policy issues" to discuss with the White House, Weissman said. "They'd get a better listen-to than if they contributed zero," he said. Obama acknowledged as much when he refused corporate contributions in the first place, which to some critics makes his reversal more frustrating than if he'd followed past presidents and simply taken them all along. Officials with the Presidential Inauguration Committee point out that Obama has maintained his 2009 ban on contributions from lobbyists and political action committees. Corporations who want to give will be vetted to avoid conflicts of interest, but a committee spokeswoman did not provide any guidelines about how such firms would be weeded out. She provided a couple examples: if a company is "under consideration" for a federal contract, or if a bank has been provided money from the Troubled Asset Relief Program, which sought to help financial institutions hurt by the subprime mortgage crisis. The committee has been gradually releasing the names of contributors on its website, which, as of Jan. 8, included a handful of corporations, Microsoft and AT&T being the largest. Both companies have multimillion dollar contracts with the federal government, and lobby the administration heavily. The size of their contributions were not disclosed. Employees from Microsoft gave more than those from any other company in 2009, according to the Center for Responsive Politics. Addie Whisenant, the inauguration committee's top spokeswoman, said a full list of contributions would be available 90 days after the inauguration. “The Presidential Inaugural Committee is continuing its pledge of transparency for the American people and is taking extra steps to provide the public with ongoing updates about who is donating to the Inaugural," she said in a statement. A committee spokeswoman would not say how much the president hoped to raise, or how much the inauguration ceremonies is expected to cost. In 2009, the committee raised a record $53 million despite the ban on corporate donations and a $50,000 cap on any single donation. Donors aligned with financial firms gave the most money, with lawyers and law firms coming in second. This time around, the committee is offering packages of tickets to the inaugural ball, parade and other events at prices up to $250,000 for individuals and $1 million for "institutions." Still, the 2013 event is expected to be far less expensive than 2009, because the festivity have been dialed back, as is tradition for second inaugurals.